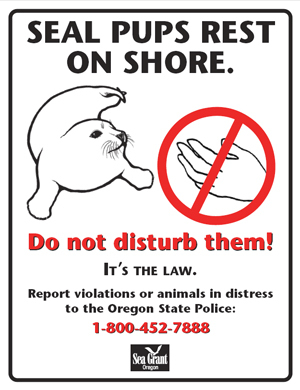 NEWPORT, Ore. – The arrival of spring has brought a number of young seal pups onto Oregon beaches, where they are at-risk from well-meaning coastal visitors who want to “rescue” them. “Seal pups being left alone on the beach in the spring is perfectly normal,” said Rice, who coordinates the statewide Oregon Marine Mammal Stranding Network headquartered at OSU’s Marine Mammal Institute at the Hatfield Marine Science Center. “Newborn pups typically spend several hours each day waiting for their mothers to reunite with them.